Here's a stately vessel ideal either as a family cruiser or for living abroad permanently. Cruisemaster 40 is a splendid combination of triple cabin comfort with well planned family liveability and the availability of high speed cruising when suitably powered. 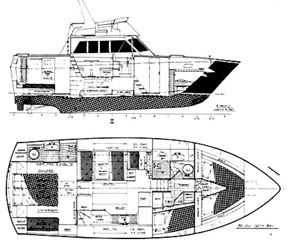 Alternate plans are available for either twin or single screw installations, giving an estimated 20 knots from twin 260 hp diesels or 14 knots with 174 hp single power plant. For steel constructions deduct approximately 10% from these speeds owing to extra weight.The hull offers good sea keeping abilities for coastal cruising. Entrance to owner's stateroom with queen size bed is by winding stairs from the saloon. Other features include: Dual steering, large flybridge, 12' X 10' midships saloon with galley, dinette and inside steering position toilet and ablution blocks. The fore and aft deck space for a vessel of this size is generous. Minimum headroom 6'. Plans & Patterns Only $99, Was $450. DRAFT AFT TWIN SCREW 3' 6.5"
DRAFT AFT SINGLE SCREW 4' 9"